I took one of my recent sets of tiny watercolors and had them made into an 8 x 10 inch giclee. It has four species of Galapagos finches: Geospiza scandens (Cactus Finch), Geospiza magirostris (Large Ground Finch), Certhia olivacea (Warbler Finch), and Camarhynchus parvulus (Small Tree Finch). Galapagos finches, drab they may be, have been oh so important in helping Charles Darwin (and thus the rest of us) understand how animals adapt and evolve. Yay for you, tiny Galapagos Finches! You each get little ornate frames. Time for a Tiny Aviary Giveaway. Post to the comments section here, and I will enter your name to the contest drawing. Next week (Wednesday perhaps?) 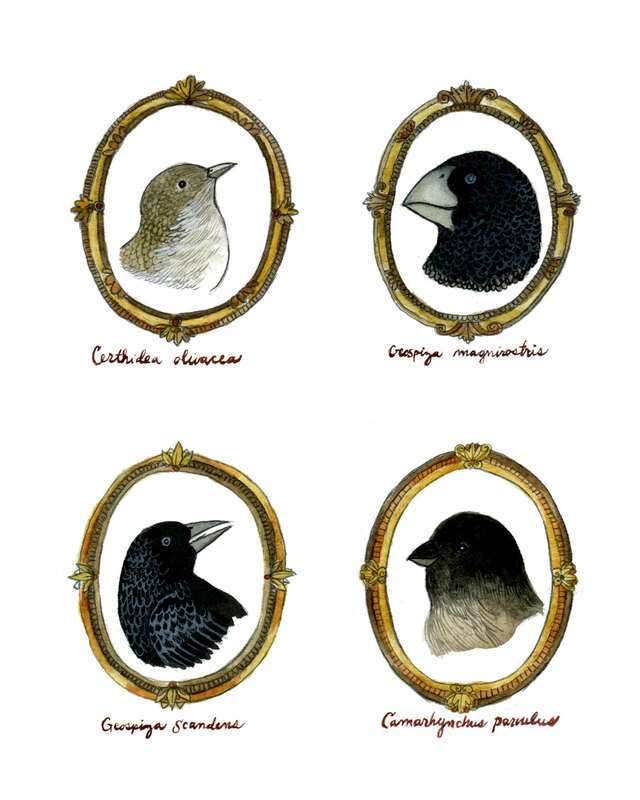 I will draw one of your names, and the winner will get a free copy of the new Galapagos Finches print. That day I will also have a 15% off of everything sale in my shops; a little spring cleaning. Now THIS is the best contest I have ever seen on the Internet and probably the only one I would enter ;-) Consider me on board for the drawing . . . Please add me into the drawing! I am a person who like to win. I am ruthless. I miss the 80s, when my vices were considered virtues. as with all your work, these are lovely. thanks for the chance to win. This is beautiful! I'd love to put my name in the running! Hi Diana! Please enter me! Thank you. Kindly ignore the rest and pick me. too good to be true! this print will look very nice next to the one we bought with the bicycle. Wooooo! Entering the contest! Beautiful work. I'm off to go tweet about it even though that will reduce my chances. oh yay. this would look lovely hanging in our new addition. I love all things tiny aviary. Please put my hat in the ring, or my name in the hat. Definitely put me in!! I read The Beak of the Finch a while back, and have always been fascinated my the Galapagos Finches. Nifty birds!! I love your gorgeous finches, please enter me in your competition! Yay for tiny galapagos finches! So cute! Yeah! Great to see Tiny Aviary back up and running. Enter me in your giveaway --but only if the winner is chosen by a red-breasted nuthatch who swoops in to choose the winner. But I'm sure that's how these things are done? This bird nerd is in (please)! I would adore having those framed in my house. I love your work. How wonderful to have a chance to win one of your prints. Thank you, thank you and I promise to give the Galapagos Finches a good home! i need those beaks in my life. excellent - please enter me! Atticus and I would love this print. Get it? Atticus? Finch? Atticus Finch? Hahahahahahahahahahahahahahahaha!!! Please enter me. The Modest Mouse has some of my favorite avians. Finches in frames? How perfectly, comically lovely. Hi, Di! Please enter me too. Great contest! Thanks! Yes please! Thanks so much for the opportunity. So glad that you are posting again regularly, and hope you are enjoying motherhood. Oh what a wonderful giveaway! I love your little finches in their gorgeous little frames. I saw two Black-billed Magpies today driving through Vail... I'm feeling lucky. My mom gave me your owls print for Christmas and I would love to start a collection, your prints are so beautiful. Thank you for the chance to win something! always wanted to tell you how much I LOVE your work and blog. seemed rather lame, but now I have a chance to do just that and maybe win a sample of your work! 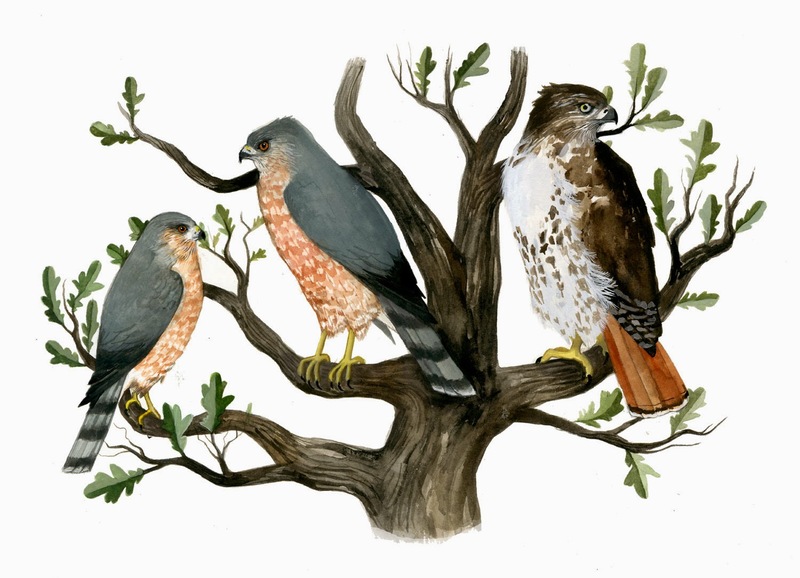 Not sure I love birds or your drawings of them more... err, well, you know what I mean... glad you are back! I think a little boy would definitely enjoy having these guys in his bedroom. Count me in! I really love your work, so I'll toss in my name! I've always loved those finches! Enter me in yourr drawing. Ohhhh I love this so so much. My heart started beating really fast when I saw the prize for the giveaway. lovely birds! would go great with the darwin print. Am I too late to enter? I teach about the Galapagos Finches so your work would be awesome to share with my high school students! How in the world did I miss this??? ?